Info-graphic for conveying the benefits of AccuBoost compared to alternatives. 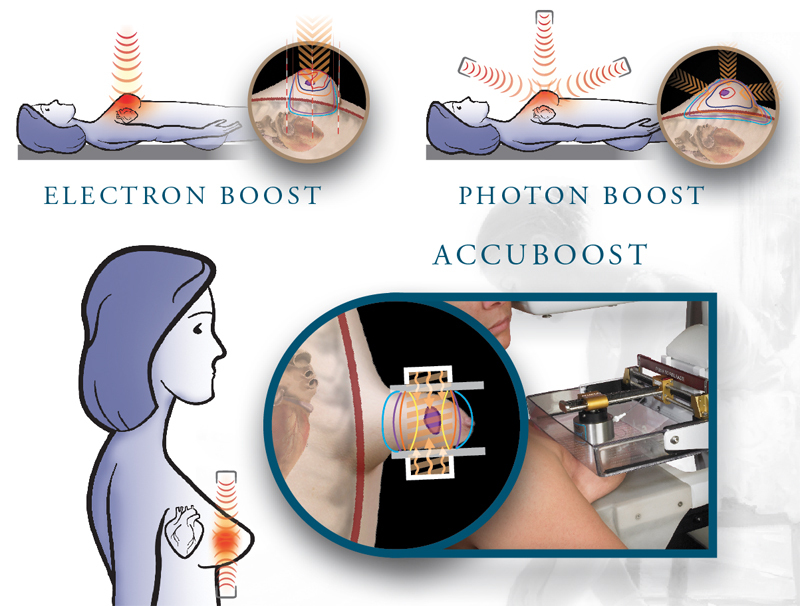 In explaining the benefits of AccuBoost to patients, there can be no doubt of the validity of the old adage: “a picture is worth a thousand words.” Based on an AccuBoost user’s request, a visual aid has been developed that shows the conceptual differences between the AccuBoost approach and electron or photon boost designs. With the patient in an upright position, AccuBoost delivers the dose parallel to the chest wall as opposed to alternatives with the patient in supine position where a portion of the external beam exposes the heart, lungs and chest wall. These graphics are available to AccuBoost users, in poster or data sheet format, to aid in explaining the benefits of the procedure.